Olympia Monthly Meeting of the Religious Society of Friends [Quakers] noted with deep concern the Ugandan Government’s passage of a law targeting the LGBTQ population. This law has created a climate where the life, health, and freedom of all LGBTQ Ugandans and those who help them are at immediate risk. We are appalled at hearing about those who have already been kicked out of their homes, denied basic rights, abandoned, beaten, imprisoned, or killed, or who live in constant fear. Olympia Monthly Meeting has been called to create the “Friends Ugandan Safe Transport Fund” to aid LGBTQ Ugandans who are fleeing their homeland for their lives and safety. We have been given an opportunity to provide direct assistance that will save lives. In the first year of this effort we helped 1004 Ugandans get to safety and freedom. [Please see the FAQs page for current numbers and other important information.] Many others remain at risk, and are trying to escape. We call on all Friends, both individually and in their Meetings, Friends’ organizations, and all people of good will, to help us in this effort. The Olympia Fellowship of Reconciliation’s January 2016 TV program lifts up a bold, compassionate, non-violent way to help people who are in danger because of the homophobic political culture in the African nation of Uganda. 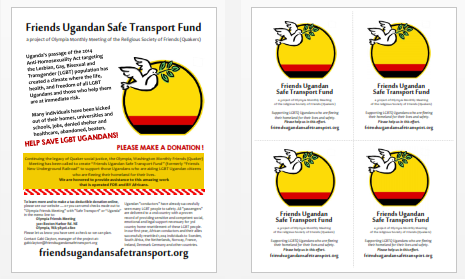 The action began with courageous, compassionate people within Uganda and is supported by Quakers and other people in Olympia WA USA and elsewhere.